Because the intention is to send multiple missions to a single location in order to establish a permanent human presence on Mars, it’s especially important that the location be a good one. The purpose of this section is not necessarily to identify a single optimal location for the IMRS, as that will require a more detailed analysis involving numerous experts from a variety of disciplines, but merely to highlight some of the salient characteristics such a location would have, and suggest a general approach. Availability of key location-dependent resources such as sunlight, heat and water. It may also be advantageous to be forward-thinking and also consider other location-dependent resources that will become more important in the future, such as wind and areothermal energy, minerals and metals, caves and lava tubes, and even tourist attractions. Terrain characteristics. For safety in landing, and ease and safety of surface mobility both in marssuits and surface vehicles, the location should be reasonably flat, level, and not overly dusty. In addition, it may be useful to have loose regolith available for piling around the SHAB for radiation protection and thermal insulation. Scientific interest. The best location will be close to sites that can help to answer scientific questions about Mars. Most importantly, has Mars ever hosted, or does it currently host, life; and, if so, what were, or are, its characteristics? Other questions relate to the presence of liquid water, nitrogen and other volatiles, and Mars’s areological history. It’s worth considering that, although planners will aim for the most scientifically important place, in reality anywhere on Mars will be of tremendous scientific interest to the first explorers. Previous Mars missions, and the DRA, have primarily favoured scientifically important locations, in alignment with the intention to continue exploiting the scientific goldmine that is Mars, and the belief that human missions are likely to be few and therefore only a handful of the very best locations can be visited. However, the plan for the IMRS is that there be many human missions and expeditions as part of a broader program of settlement and research, and that ultimately all of Mars will be explored. With this in mind, selecting a site of maximum scientific value is less important than selecting one with maximum potential for supporting long-term habitation, because infinitely more science will be possible once a permanent presence is established. As has been pointed out before (Zubrin & Wagner, 1996), it’s considerably easier and cheaper to provide long-range surface mobility on Mars than to run additional missions to new locations. With settlement in mind, availability of critical resources such as solar energy and water are the strongest drivers for location selection, and to some degree these are at odds with each other. With increasing distance from the equator, the percentage of water ice in surface regolith increases, but, as on Earth, the availability of solar energy decreases. The best location choice will balance these, and is therefore likely to be somewhere between around 30-60° north or south. For a number of reasons related to terrain and Mars’s unique orbital characteristics, as will be shown, north is preferable. The section on Energy discusses the various reasons for favouring solar energy over other options. Due to the mission’s reliance on it, intensity and availability of solar energy are especially important factors in location selection. On Mars, as on Earth, the intensity of sunlight reduces with increased latitude. However, due to the eccentricity of Mars’s orbit, northern latitudes enjoy milder weather than the southern. This can be advantageous for a northern situated solar-powered settlement, as the mass of the power system is reduced. Mars has an axial tilt of 25.2°, which is similar to Earth’s axial tilt of 23.4°. This gives it a similar cycle of seasons. However, Mars’s orbit is somewhat more eccentric than Earth’s. 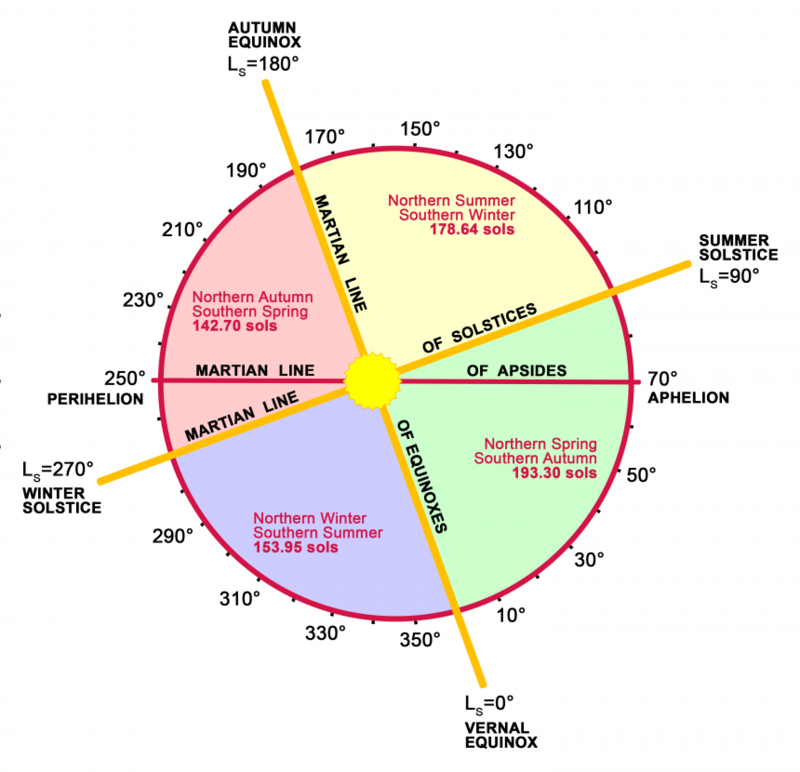 Aphelion (when Mars is farthest from the Sun) occurs during the northern spring/southern autumn; and thus perihelion occurs during the northern autumn/southern spring. The effect is that seasons in the north are milder, whereas seasons in the south are more intense. The southern hemisphere has short, hot springs and summers, and long, cold autumns and winters. The north has long, cool springs and summers, and short, warm autumns and winters. The net effect with regard to solar energy is that, in the northern hemisphere, there is less variation in the amount of solar energy received per sol during the course of the Martian year. The latitude 31°N has the highest minimum solar energy for a single sol during a Martian year (Cooper et al. 2010). In other words, the shortest sol of the Martian year at 31°N receives more sunlight than for any other latitude. This affects energy needs as well as energy storage requirements. The longer the settlement must spend in darkness, the more solar energy it must be capable of storing. A settlement located in the south will require greater energy storage capacity to get through the long, dark winter, in addition to greater energy requirements for heating. The northern hemisphere requires less energy for heating during the milder winter, and the days are longer so more solar energy can be collected and stored. For maximum exposure to sunlight, the location cannot be deep in a crater or chasm, as this would decrease the amount of time the PV (Photovoltaic) cells are sunlit each sol. Rather, it should be out in the open where it receives as much sunlight as possible. This is congruent with the need to land somewhere flat, and the open, flat terrain of the northern hemisphere supports this requirement. Due to the low temperatures, one of the primary energy requirements of a habitat on Mars will be heating (see Energy for Habitats), and the best source of heat at the surface of Mars is the Sun. Selecting for high solar incidence simultaneously selects for warmth as well. Two other factors that will affect availability of thermal management at the base are elevation and thermal inertia. There are two main reasons for selecting a site at low altitude, and both are related to the fact that the atmosphere is thicker at lower elevations, as on Earth. It will be warmer. The Martian atmosphere is warmest at lower elevations, as the thicker air functions as a thermal blanket. The thicker atmosphere facilitates EDL technologies that use the atmosphere for deceleration; for example, parachutes, aeroshells and blunt-body capsules. The altitude on Mars is generally lower in the north. The flattest, smoothest, and also almost the lowest region of Mars is Vastitas Borealis, a vast area spanning the northern hemisphere that may have once been the floor of a huge ocean, usually referred to as “Oceanus Borealis”. Vastitas Borealis is at a much lower altitude than the southern highlands. This is another important factor in favour of siting IMRS in the northern hemisphere. 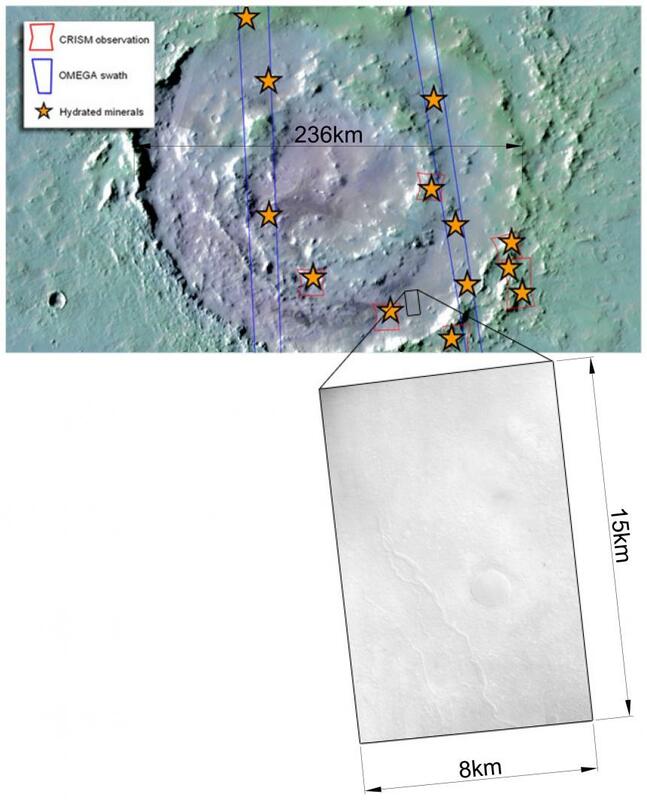 The lowest place on Mars is the huge impact basin in the southern hemisphere, called Hellas Basin, and for this reason some have proposed Hellas Basin as a suitable location for a base. It would be extremely interesting scientifically; however, it would not exploit other advantages of the northern hemisphere, the terrain is not very flat, and it’s a dust trap. In fact, Hellas Basin is one of the main regions from where dust storms erupt. One potential downside to choosing a location at low elevation for IMRS is that, if plans for terraforming proceed as envisaged, Vastitas Borealis may again become Oceanus Borealis, and the location of the IMRS — an extremely important historic site — will become submerged. Perhaps a watertight dome can be built over the site to protect it. The various advantages of the north plus the benefit of living near water suggests that on a terraformed Mars, the bulk of the population may choose to settle along the shore of Oceanus Borealis. Thermal inertia refers to the ability of the terrain to retain heat. Small particles, such as dust, have low thermal inertia, i.e. they lose heat rapidly. Boulders and exposed bedrock have high thermal inertia, i.e. they retain heat longer. This is why people use exposed slabs of polished concrete indoors, as a thermal mass to reduce heating costs. A very low thermal inertia implies thick dust, which would not retain heat and could impede mobility in marssuits and surface vehicles. Dust is also less useful for piling around and on the SHAB for thermal and radiation protection. A high thermal inertia is advantageous as the surrounding rock will serve to keep the base warmer after sunset, reducing energy requirements. A high thermal inertia may imply large boulders, which could impede mobility of surface vehicles and compromise safety when landing; or, very shallow bedrock, which could damage surface vehicles. Excavation, which may be desired for future development of the base, would also be more difficult. A medium thermal inertia implies loose regolith, which may be useful for piling around and on the SHAB, both for insulation to maintain habitat temperature after nightfall, and for radiation protection. Mobility in marssuits and surface vehicles. Blue Dragon requires safely landing the MAV, SHAB, CAMPER and cargo capsules in approximately the same location. However, note that they will not be directly adjacent to each other, because landing any item will kick up large amounts of dust and debris; therefore, each item must be landed some distance, perhaps as far as a few hundred metres, from the others. The CAMPER must be able to negotiate the terrain between these elements, and the surrounding area. In addition, the AWESOM (Autonomous Water Extraction from the Surface Of Mars) robot, discussed in In Situ Water Production, must be able to traverse the ground around the MAV. In order to minimise the probability of landing on a large boulder, smoother terrain is preferred. Fortunately this corresponds with the usefulness of finding a location near a potential source of areothermal energy, because it’s the locations that have most recently been covered in lava (and therefore have few craters) that are most likely to still be areologically active. The downside of choosing an especially smooth area is that there may not be much of areological interest in the vicinity, which means more ground will have to be covered using the CAMPER rather than on foot. However, safety is a priority. The goal will be to locate the base within, at most, a few hours drive away from areologically interesting regions. One of the key goals of the IMRS is to make use of locally obtained water. The small amount of water vapour in the Martian atmosphere may be sufficient to support recycling losses in the life support systems, but will not provide enough hydrogen for manufacture of ascent propellant. It will therefore have to come from the ground. 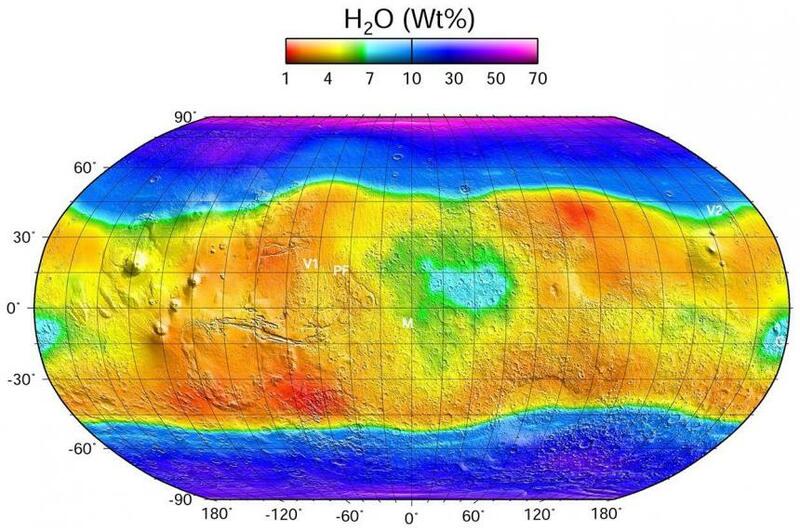 The ground on Mars is above 20-30% water beyond ~60° north and south, which is attractive. However, at these latitudes the solar incidence is somewhat low. If the goal is to remain close to 31°N, yet also have at least 10% water concentration in the regolith, these requirements may be balanced by selecting a location around 35-45°N. 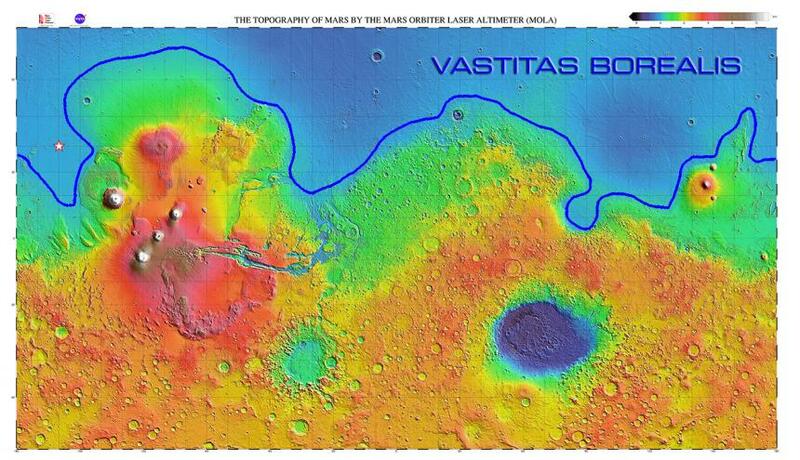 The areas with the highest water content near these latitudes are north-north-west of Olympus Mons, and north of Hecates Tholus (near Viking 2). More water, in the form of both ground ice and atmospheric water vapour. A higher minimum solar incidence. Higher probability of areothermal energy sources and aquifers, which translates to a higher probability of finding extant life. More potential for discovery of mineral ores of the type formed by interaction between magma and liquid water. The smooth terrain, an advantage for safe landings and surface mobility, also means fewer sites of scientific interest; yet the base needs to potentially support decades of research. This could be addressed by improved surface mobility, such as longer range surface vehicles or aircraft. The lack of exposures through the crust formed by large valleys and craters could make it difficult to access potential mineral resources in the future. Because the base is reliant on solar energy (see Solar), it should be located close to the optimal latitude of 31°N in order to minimise the mass of the power system. However, by going a little further north, more water can be accessed while still being in a fairly sunny latitude. One consideration is that, as latitude increases, the angle with respect to the MCOS (the areostationary satellite) becomes less favourable. Somewhere in Vastitas Borealis may be optimal, as this region is low, flat, reasonably smooth, and has plenty of ice. However, it would be less than ideal to locate the base in the “middle of nowhere”, as it were, because of the distance from interesting sites. If the various components can be landed with a reasonably high degree of accuracy, then the base could be positioned within driving range of features with greater scientific interest. This may be the sweet spot in this region just northwest of Tharsis. There’s abundant water at relatively low latitudes, with good solar incidence, and it’s low and flat. This is one of the smoothest regions of Mars due to also being one of the most recently areologically active at only 100 million years old. This increases the likelihood that sources of areothermal energy will be found. In a lot of the low areas of Arcadia, one finds grooves and sub-parallel ridges. These indicate movement of near surface materials and are similar to features on Earth where near surface materials flow together very slowly as helped by the freezing and thawing of water located between ground layers. 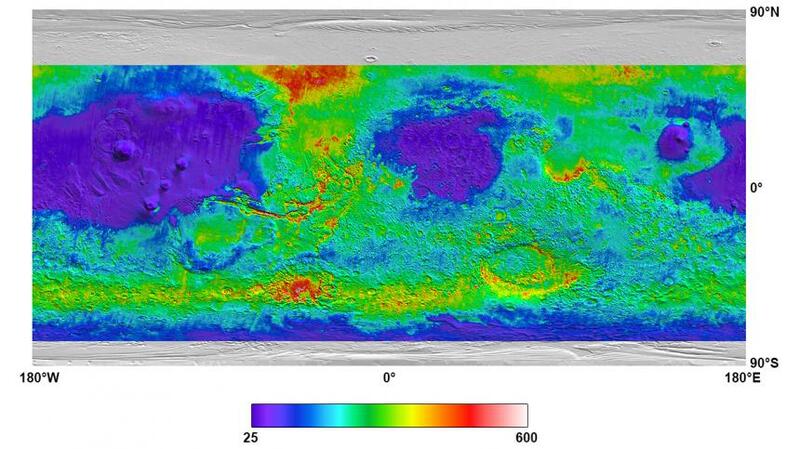 This supports the proposition of ground ice in the near surface of Mars in this area. This area represents an area of interest for scientists to investigate further. Areothermal heat in combination with underground ice could produce aquifers at this location, which would be of tremendous interest as a resource as well as a potential home for extant Martian life. This location is also close to Olympus Mons, one of the most famous and impressive features in the entire Solar System, which is both scientifically and aesthetically interesting. Olympus Mons will probably become the site of numerous settlements, purely for the views. The thermal inertia is generally low to medium, indicative of dust, however, the data indicates there may be less dusty regions that could be suitable candidates for siting the base. This area is flat and smooth, has about 7-10% H2O, good solar incidence, low elevation, and moderate thermal inertia. The area is areologically very young and considered a candidate for areothermal energy. It’s also within striking distance of Phlegra Montes, where radar probing has indicated large volumes of water ice below the surface. This site is also close to older terrain in addition to inflow features of Cerberus Fossae, which would be of considerable areological interest. Lyot is one of the more interesting features in Vastitas Borealis, 236 km in diameter, and the deepest point in the northern hemisphere. Although not itself a smooth region, being in Vastitas Borealis means that IMRS could be located at a smooth place nearby, within easy driving distance of the crater. Alternately — again, assuming high-accuracy landings — IMRS could be located inside Lyot, providing a wealth of research for many decades. Regional drainage patterns suggesting liquid water stability at the surface are confined to early in the history of Mars, prior to a major climate transition to hyperarid cold conditions. Several later fluvial valley systems have been documented and are thought to have formed due to local conditions. Fluvial valley systems within Lyot crater have the youngest well-constrained age reported to date for systems of this size (tens of km). These valleys are linked to melting of near-surface ice-rich units, extend up to ~50 km in length, follow topographic gradients, and deposit fans. The interior of Lyot crater is an optimal micro-environment, since its low elevation leads to high surface pressure, and temperature conditions at its location in the northern mid-latitudes are sufficient for melting during periods of high-obliquity. This micro-environment in Lyot apparently allowed melting of surface ice and the formation of the youngest fluvial valley systems of this scale yet observed on Mars. Thus, the higher air pressure in Lyot, an effect of the low elevation, can occasionally produce a localised climate at which water is stable in a liquid state at the surface. As liquid water is considerably more accessible than either ice or water vapour, this is an especially high-value resource for explorers and settlers. Even if liquid water is not or rarely available at the surface, it may be present close to the surface and accessible via drilling. Perhaps more importantly, liquid water may be indicative of life, as it always is on Earth. Lyot could potentially support decades of scientific research in areology, astrobiology and ISRU. The following map shows known locations of hydrated minerals in Lyot, as detected by CRISM (Compact Reconnaissance Imaging Spectrometer for Mars) and OMEGA (Observatoire pour la Minéralogie, l’Eau, les Glaces et l’Activité, a.k.a. the Visible and Infrared Mineralogical Mapping Spectrometer). In addition, a close-up is shown of a region in south-east Lyot with a 10 km-long fluvial valley (i.e. ex-river bed) and a small, 1 km-wide crater. The surrounding area is quite smooth and more than large enough to accommodate the development of the IMRS. The landing ellipse for Curiosity was 20 km by 7 km. If this could be reduced to, say, 8 km by 5 km, it should be possible to land base components inside Lyot safely. Lyot’s latitude is somewhat high, reducing solar intensity, and locating a base inside a crater will also affect solar power production. However, if the site is considered sufficiently valuable, this problem could be solved with additional PV and energy storage hardware.